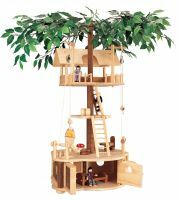 The Deluxe Tree House is a sturdy wood toy that is a continuation of a tree house village. This particular deluxe tree house comes with a variety of detailed accessories and is a single set that exists in the Tumble Tree House line. As your child’s tree house collection grows, so will the exciting imaginary adventures. Includes furniture, ladders, fake tree with bendable leaves, and more! Dimensions: Base Diameter 21" Pole Height 39"